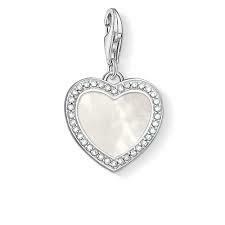 From Thomas Sabo Charm Club is this Mother of Pearl Heart charm. A stunning addition to any Thomas Sabo charm bracelet. This charms adds a personal touch and is a gift for her. This Thomas Sabo Mother of Pearl Heart Charm features a heart shaped design with Cubic Zirconia stones lining the inside of the charm. The inside of the heart is embellished with a Mother of Pearl stone. This makes it stand out on your Thomas Sabo charm bracelet. This charm is crafted from 925 Sterling Silver, Cubic Zirconia stones and Mother of Pearl.